Father's day is approaching soon, and dad needs a gift. Can't think of any bacon gifts for him? We have the answer. Bacon, Bacon, Bacon, and BACON! Dad's Bacon Box is a bundle for the Ultimate Bacon Lover. It's for the Dad who loves traditionally smoked bacon almost as much as he loves branching out and exploring the other bacon varieties available in the bacon world. Why have just one flavor or bacon? 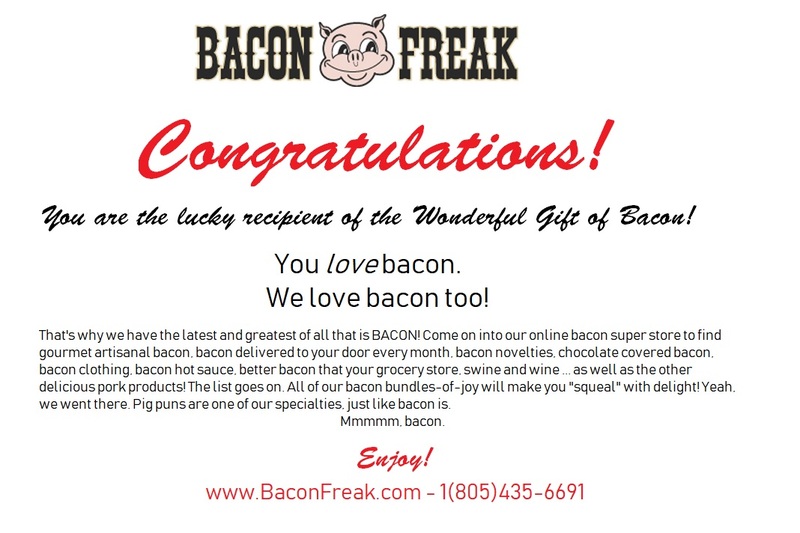 With all the different flavors of gourmet bacon that Bacon Freak provides, he'll never be limited to just one flavor again! Which variety will become Dad's favorite? We suspect they all will, with Dad's Bacon Box! •4 Packages of Gourmet Bacon, we will select a nice mix for Dad. If there are particular flavors your dad would like, list them in order comments at checkout. *Each package contains 14-16 oz. of bacon.